THE UN SECURITY Council has unanimously backed a US-drafted resolution that significantly strengthens sanctions on North Korea, imposing a ban on exports aimed at depriving Pyongyang of $1 billion (about €850 million) in annual revenue. The resolution imposed a full ban on exports of coal, iron and iron ore, lead and lead ore as well as fish and seafood by the cash-starved state — stripping North Korea of a third of its export earnings estimated at $3 billion (about €2.5 billion) per year. 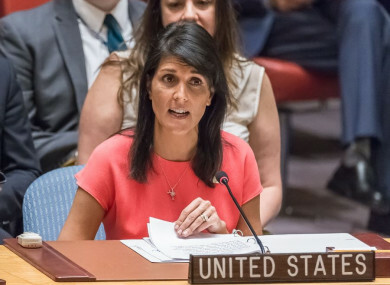 US Ambassador Nikki Haley said the stiffer measures brought the penalty imposed on North Korea for its ballistic missile tests “to a whole new level” and that the council had put leader Kim Jong-un “on notice”. “This is the most stringent set of sanctions on any country in a generation,” Haley told the council after the vote. Trump hailed the unanimous vote, saying on Twitter the sanctions will have “very big financial impact”. “The President appreciates China’s and Russia’s cooperation in securing passage of this resolution,” the White House said. The statement said Trump will continue to work with “allies and partners to increase diplomatic and economic pressure on North Korea” to end its threatening and destabilising behaviour. The US entered into negotiations with China a month ago on the new resolution after Pyongyang launched its first intercontinental ballistic missile on 4 July, which was followed by a second test on 28 July. But the measure does not provide for cuts to oil deliveries to North Korea as initially proposed by the US — a move that would have dealt a serious blow to the economy. The United States has put heavy pressure on China, which accounts for 90% of trade with North Korea, to enforce the sanctions and the fate of these measures largely hinges on Beijing’s cooperation. China and Russia had resisted the US push, arguing that dialogue with North Korea was the way to persuade Pyongyang to halt its military programs. Chinese Ambassador Liu Jieyi said the resolution “does not intend to cause a negative impact” to North Korea’s people and stressed that it called for a return to talks on denuclearisation of the Korean peninsula. “The fact that the council adopted this resolution unanimously demonstrates that the international community is united in its position regarding the nuclear issue of the peninsula,” Liu said. Russian Ambassador Vasily Nebenzia stressed that sanctions “cannot be an end in themselves” but rather “a tool for engaging this country in constructive talks”. Backed by Japan, South Korea and its European allies, the US has maintained that tougher sanctions would put pressure on North Korea to come to the table. Speaking to reporters after the council vote, Haley said “what’s next is completely up to North Korea”. “The United States has been loud about it, now the international community has been loud and North Korea now has to respond,” she said. McMaster, in an interview with MSNBC, said Trump had told China’s President Xi Jinping it was no longer enough for North Korea to “freeze” its programmes since it had already crossed “threshold capability” and the goal was now denuclearisation. North Korea’s nuclear ambitions are set to dominate talks today and tomorrow at a regional summit in Manila in the Philippines, which will see a rare gathering of foreign ministers from the six countries most involved in the issue — both Koreas, China, Russia, Japan and the United States. Email “New sanctions imposed on North Korea are 'a whole new level'”. Feedback on “New sanctions imposed on North Korea are 'a whole new level'”.